There are many reasons why you might want to add a custom links to your WordPress menu. The most obvious are linking out to social media profiles or other websites. Once you’ve logged into your WordPress admin area, look down the left Sidebar for the ‘Appearance’ link. Hover over it and in the fly-out menu, click on the ‘Menus’ link. This will open the Menus screen as shown in the image below. At the top of the Menus screen, next to ‘Select a menu to edit’, choose the menu you want to add a custom link to from the drop-down list, then click ‘Select’. Click on the ‘Custom Links’ heading from the menu options which appear below. Type or paste the URL into the URL text field. Add ‘Link Text’ – this is the word or words which will appear as your custom menu link, when your readers navigate and look at your website’s menu. Click on the ‘Add to Menu’ button, and your new custom link will be added to the bottom of your selected menu in the Menu Structure module to the right of the Menu screen. If you want your new custom menu link to be in a different position within your menu, click on it and drag it up to your desired position. Remember, as with all links in the WordPress menu, your new custom link can be a main or sub-menu link too. Just drag it to the position required. This annotated screenshot should make things clearer. Don’t forget to Save your updated menu! Click on ‘Save Menu’ before exiting the Menu screen, otherwise your changes will not be saved or published to your website. In future posts we will cover creating menus, custom menus and even menus using categories and WooCommerce product menus. 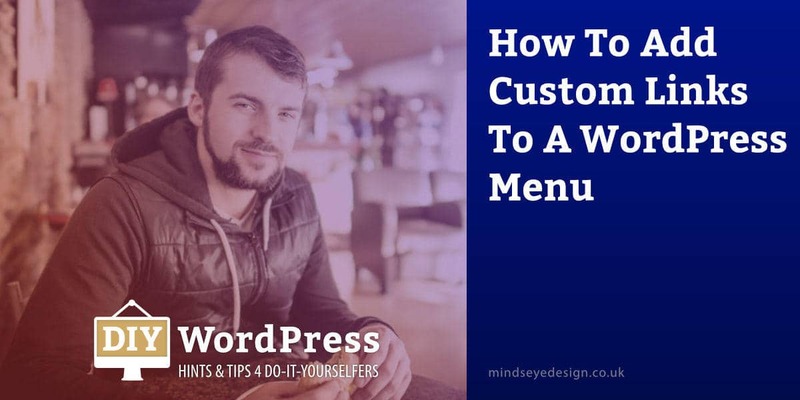 WordPress is very flexible when it comes to adding and maintaining menus throughout your website. From your main top navigation menu to sidebars and even footer menus, WordPress provides a very simple way to manage and look after them all. Custom links within menus offer you flexibility and options – another reason we love using WordPress for our website design projects.